To put on the bridle, grasp both nosebands and the crownpiece in one hand and then loosen up the bridle by pulling outwards, so there is plenty of room for horse's nose. Pull the bridle over the nose, holding the two nosebands in place (so they don't fall off the nose) while you bring the crownpiece up over the ears. Finish by taking any slack out of the crossunder reinstraps. 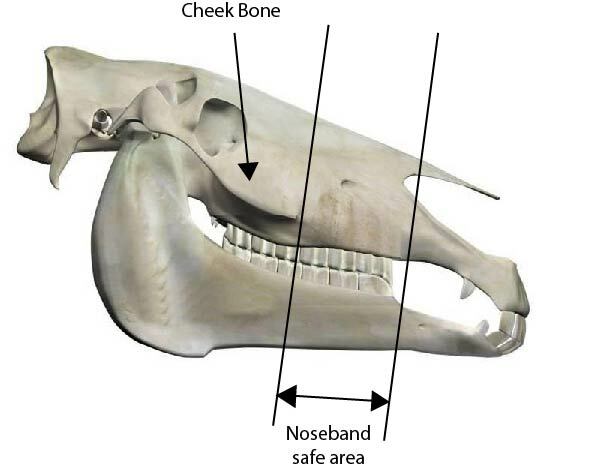 Adjust the cheek straps to make sure the double nosebands lie within the 'safe area' of the nose (within 1” of the Cheek bone protrusion, see picture below). The nose bone diminishes and turns into cartilage as you travel downwards, so be careful to avoid this delicate area at the front of the nose. The cheek straps can be trimmed if there is excess. To trim: cut with scissors and then melt the ends with a lighter or match, to prevent frying of the ends. Any reins can be attached to the rings at the end of the cross under reinstraps. We recommend lightweight reins with snap ends or scissor clips. Reins are attached to the metal rings at the end of the cross under reinstraps. The reinstraps should be shortened by retying the double fisherman knots (see below or on our website) to where they meet lightly below the jaw, to prevent your horse from stepping through the reinstraps when lunging or leading. Excess reinstrap cord should be trimmed and the ends melted with a match or lighter, but be sure to leave enough slack in the reinstraps for putting on the bridle. The UBB is well suited for tacking up your horse in cross ties or tying them up, just hook into the metal rings at the end of the reinstraps. The Ultimate Bitless Bridle requires no adjustments to lunge or drive. Lunging is super easy (just hook your lunge line into both reinstrap rings) and perfectly suited to the Ultimate Bitless Bridle. An alternative lunging method is possible with your reins still attached to the reinstrap rings. Secure your reins to the saddle, either looped under your stirrups or attached to your d-ring/bucking strap and then attach the lunge line to the inside ring. Make sure your reins are attached at the saddle, so there is no possibility of your horse stepping through the reins. Driving or ground driving is very easy accomplished by hooking your driving reins to the bridle reinstraps. The UBB is the only bridle which allows you to lunge or drive on a single rein and not have to worry about the bridle twisting on the nose.